# Research and Digital Literacy. 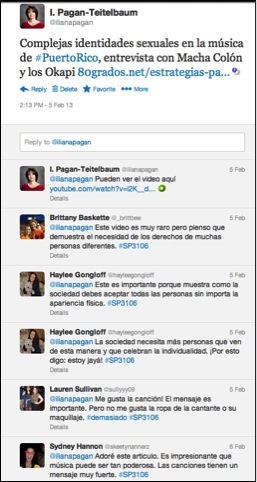 Tweeting is a valuable way to get students surfing the web for materials related to Latin America. The goal is that students acquire digital literacy regarding academic uses of social media while researching and evaluating alternative sources of information about Hispanic cultures and history. The process aims to continue expanding your knowledge of Latin American film and culture outside of the classroom. # Knowledge Commons. Student posts create a collective research repository on Latin American film, history, and culture, and any topics discussed in class. This becomes a valuable resource for the class. I can include some of the posted materials in class and in future courses. # Engagement. The discussions on Twitter are a digital continuation of our classroom discussions outside of class. They also give me valuable feedback on student reactions and ideas regarding the assigned topics and materials that we are working on in class.